Preheat oven to 180°C/350°F. Add milk and honey to a saucepan and bring to a simmer on low heat. Then, transfer to a container with a spout. In a large bowl, mix flour, ground almonds, baking powder, cocoa powder, cinnamon, ginger, clove, nutmeg, and a pinch of salt. In a standing mixer or with a hand mixer, beat soft butter and brown sugar until pale and foamy. Now beat in eggs adding one at a time until fully incorporated. Alternating, add dry ingredients and warm milk mixture to the butter mixture. Continue to beat until fully combined. Transfer batter to a greased baking pan. Spread evenly and gently knock pan on work surface to release air bubbles. Bake in a preheated oven at 180°C/350°F for approx. 25 min. until a toothpick inserted comes out clean. Set aside to cool. In the meantime, roughly chop chocolate and transfer to a large bowl. In a saucepan, heat heavy cream on low heat and bring to a simmer. Pour hot heavy cream over chocolate. Whisk together until chocolate is melted and smooth. Allow to cool for approx. 5 – 10 min. 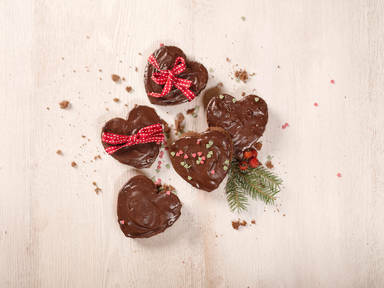 Use a heart-shaped cookie cutter to cut out cookies. Transfer to a cake rack. Place a plate underneath a cake rack to catch any excess ganache. Using a brush, spread ganache over the top of the cookies. Allow to set. Enjoy with your loved ones.